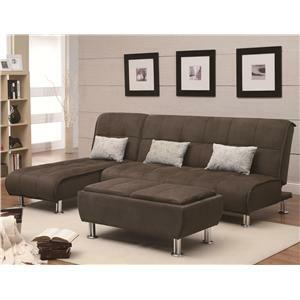 This Loveseat Sectional with Chaise Lounge makes efficient use of your room's floorspace while adding stylish and comfortable seating. 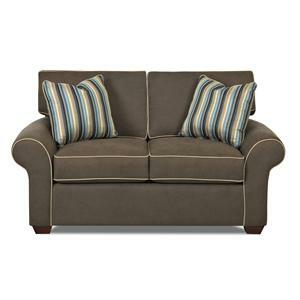 A one-arm loveseat connects with the one-arm chaise lounge and armless loveseat with a corner. 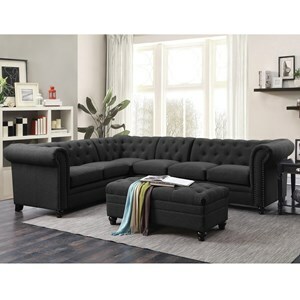 The sectional naturally provides a space that is excellent for entertaining and conducive to conversation or watching the latest new release on your TV. 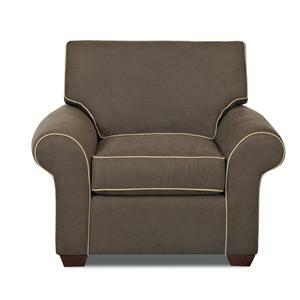 The chaise lounge creates a spot that allows you stretch out or curl into a comfortable position to truly relax. 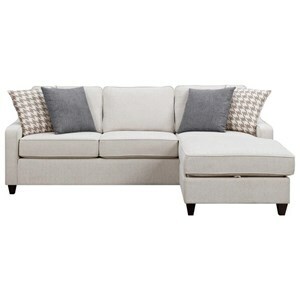 Three accent pillows complement the comfort offered by loose padded cushions and seats. 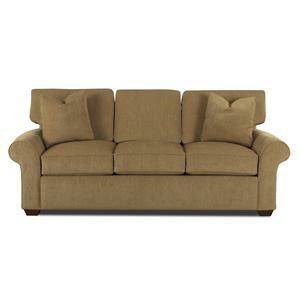 Rolled arms and tapered wood feet available in three finishes add a great final touch on the style and support of the sectional. 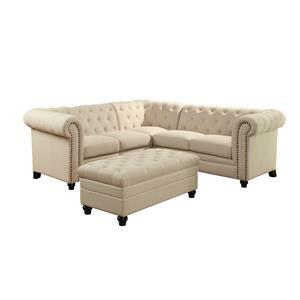 The Patterns Sectional Sofa Group with Right Chaise Lounge by Klaussner at Value City Furniture in the New Jersey, NJ, Staten Island, Hoboken area. Product availability may vary. Contact us for the most current availability on this product. 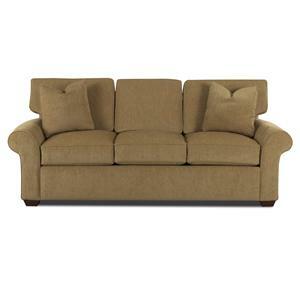 19000L LS Loveseat with 1 Left Facing Arm 1 53" 37" 30"
19000R CHASE Chaise Lounge with 1 Right Facing Arm 1 36" 65" 30"
19000 CORN Corner 1 37" 37" 39"
19000 ALS Armless Loveseat 1 45" 37" 30"
Arm Rolled arms add timeless appeal and comfortable arm support. Wood & Finish Wood feet available in Mahogany, Merl, and Oak finishes. Padding & Ergonomics Arms padded with foam or white polyester cotton. 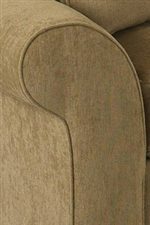 Contour of arm formed with edge roll. With its restrained lines and gentle curved arms, the Patterns collection offers a timeless, classic look with a refined contemporary feel great for a number of living areas within your home. 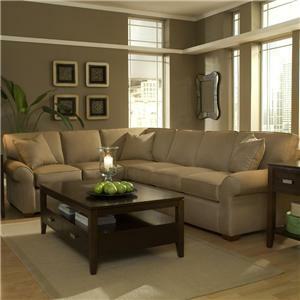 All of the chairs, sofas, loveseats, and sectionals incorporate style and comfort features. 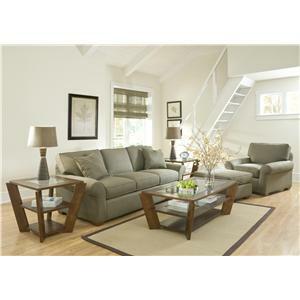 The box seat cushions, welt cord details, rolled arms, and loose back pillows display thoughtful attention to detail. 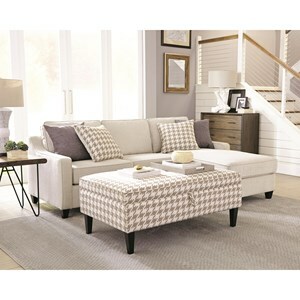 Soft square accent pillows add further softness and visual appeal. 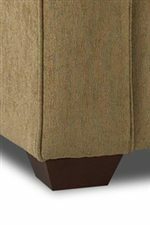 The Patterns collection is a great option if you are looking for Transitional furniture in the New Jersey, NJ, Staten Island, Hoboken area. 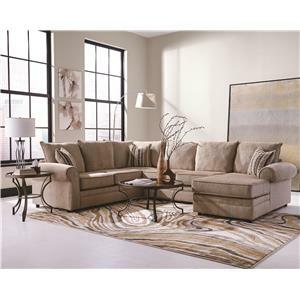 Browse other items in the Patterns collection from Value City Furniture in the New Jersey, NJ, Staten Island, Hoboken area.